wired connections to a reliable, high-speed Gigabit Ethernet network. 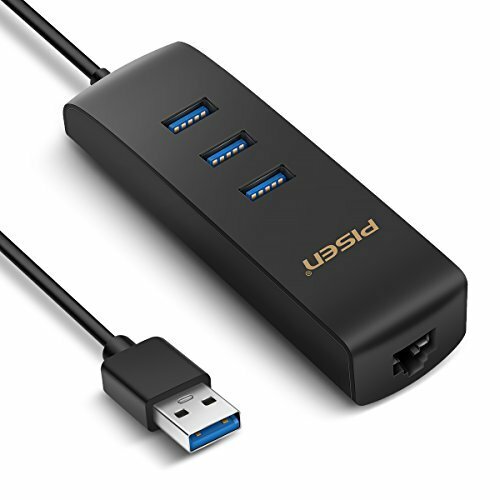 ·Simply plug the adapter into the USB port of your computer. Adds a RJ45 Ethernet port and 3 More USB ports to a computer without Ethernet port or enough USB ports, providing wired networks with speed and endurance where wireless connectivity is unavailable. Supports 10/100/1000 Mbps connectivity. Get stable and fast access to the web at speeds of up to 1 Gbps through the Ethernet port. Compact, lightweight design for maximum portability. No external power adapter, wire, or cable needed. Covered by 18-month warranty and lifetime friendly, easy-to-reach support. If you have any questions about this product by PISEN, contact us by completing and submitting the form below. If you are looking for a specif part number, please include it with your message.